Located on the Southern end of the island, just over the Big Carlos Pass bridge, Lover's Key Beach Club #108 offers its guests captivating sunset views, a private beach, in-ground spa and more! As you walk inside this luxury 1-bedroom, 1-bathroom condo, the exquisite tiled floors pave the way to many updated features! The fully-equipped kitchen has every amenity needed for an extended stay or a short getaway! The bedroom is furnished with a comfortable king size bed while the living room is equipped with a queen size sleeper sofa, allowing this one-of-a-kind condo to sleep up to 4 guests! 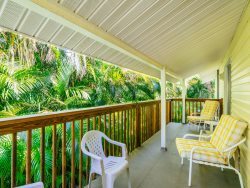 This condo also has an outdoor balcony perfect for enjoying your morning coffee or watching the gorgeous Florida sunset over the bay! Stepping outside, Lover's Key Beach Club offers guests use of the private white sugar-sand beach with chaise lounges and a fish cleaning station, a BBQ area equipped with gas grills, a game room with ping pong table, heated pool, and Jacuzzi whirlpool hot tub! A laundry room is also available on ground level, along with free private parking to ensure a hassle-free stay! Not far from your front door, you will find the 7-mile stretch of sugar-sand beach and Lover's Key State Park which offers walking and biking trails as well as canoe and kayak rentals! With just a quick trolley ride to the north side of Estero Island, you will be sure to enjoy lively Times Square, the famous pier, boating options, as well as many local shops, restaurants, and island activities!